Based on feedback from various stakeholders during our Integrated Human Practices work, we decided to perform a proof of concept experiment to detect other sweat metabolites using our system. We aimed at detecting glucose instead of ethanol in our Cell-free Mechanism, because of its obvious healthcare applications for diabetes patients. To do this we replaced the Alcohol Oxidase in our system by Glucose Oxidase (GOx, EC 1.1.3.4). This successful proof of concept experiment not only showed that our system is versatile and robust, but it also provided data for the modelling and systems testing of a prototype for our AlcoPatch. The assembled proof of concept system worked as follows: GOx oxidises glucose into D-gluconolactone and producing H2O2 as a by-product (figure 1). In the subsequent reaction, HRP is used to oxidise its substrate ABTS in the presence of H2O2, which acts as an oxidising agent. Figure 1. Glucose oxidation mechanism diagram. 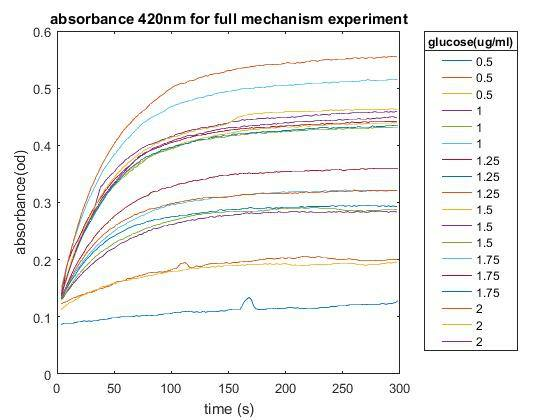 We used real-time spectrophotometry in a plate-reader to track the kinetics of the formation of the green oxidized ABTS, to characterize the response characteristics of our glucose sensor system (Figure 1). Figure 2. Absorbance at 420nm of reaction through time after the inoculation with glucose, showing an increasing absorbance O.D which implicates the increasing production of a coloured product. 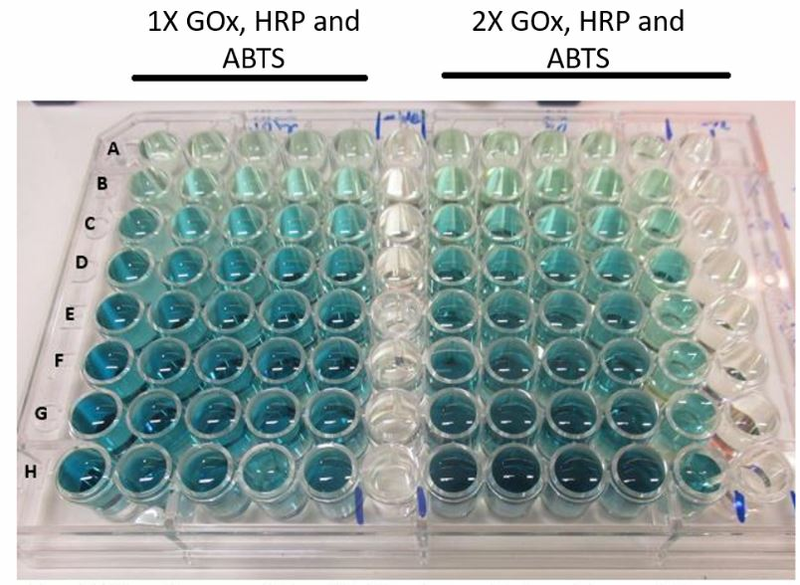 Based on this, we decided to further investigate on the optimal concentrations of GOx, ABTS and HRP to achieve the strongest possible green colour signal in response to physiologically relevant concentrations of glucose (matching those reported in human sweat)  (Figure 2). Figure 3. Schematic representation of the GOx glucose oxidation prototype using increasing concentrations of glucose from A-H. These experimental data not only establish proof of concept for our detection system, but they were also used to validate the ensemble model, by comparing the probabilistic outputs of the model with the data (see understanding the mechanism). The updated and validated model was used to answer some of the key questions that arose in our Integrated Human Practices, for example by helping us determine the optimum enzyme ratio to minimise the cost of the AlcoPatch. After successfully characterizing our choice of constitutive promoters and chromoproteins, we proceeded to obtain a working model of our mechanism. We first built Plasmid 1 and Plasmid 2 (Figure 1: How it works?) using the iGEM 3A assembly method. Figure 4. Schematic representation of the assembly of Plasmid 1. Figure 5. Schematic representation of the assembly of Plasmid 1 adapted from SnapGene. 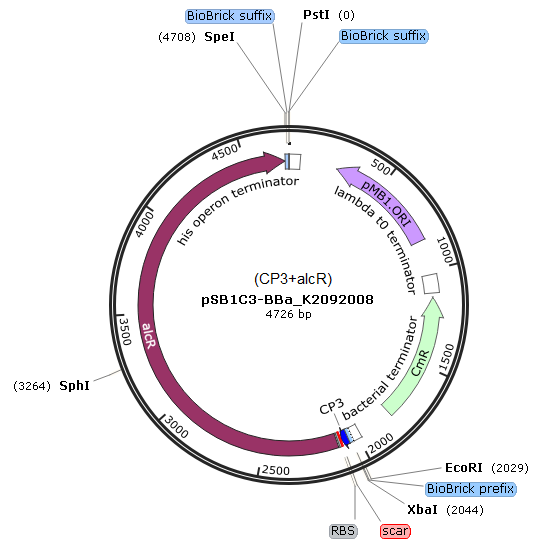 This plasmid was constructed to obtain a constant expression of the AlcR protein. 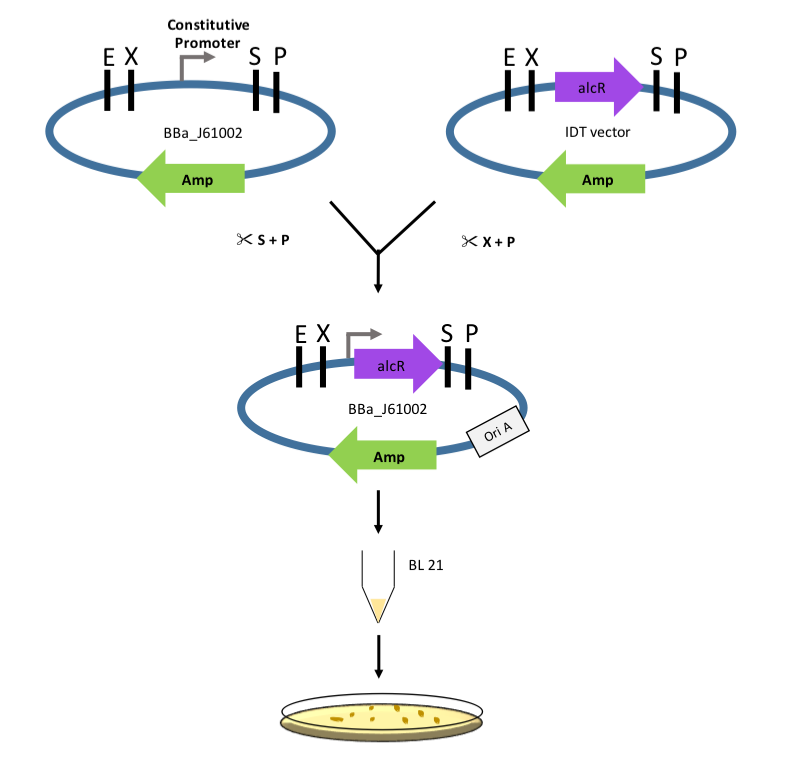 As seen in Figure 1, the constitutive promoter and the alcR were initially present in two different plasmids. They were first digested with the appropriate restriction enzymes, ligated and then transformed into E. coli DH5α. The final plasmid construct has ampicillin resistance. Upon obtaining positive confirmation of the transformants, we proceeded to transform the ligated product into BL21, a protein expression strain. Figure 6. SDS-PAGE gel showing protein expression results. As shown by boxes in the gel, the 27kDa mRFP1 protein can be clearly seen. However, no proteins can be seen at the 98kDa region where the AlcR protein is expected to be present. 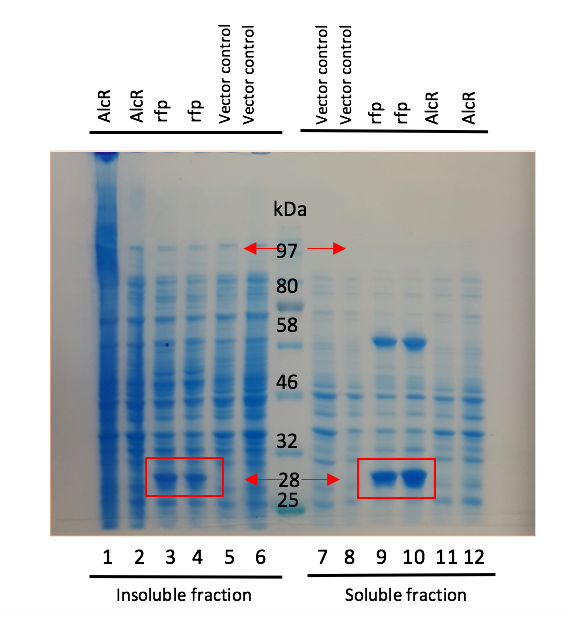 After successfully obtaining transformants with the BL21 strain, we proceeded to overexpress the protein and attempted to show the expressed 98kDa AlcR protein on an SDS-PAGE (Fig. 6). Unfortunately, after several attempts, we failed to see any visible protein band on the SDS-PAGE. This could be due to many factors, one of them being that the concentration of soluble protein fraction is not enough to be visualised on a SDS-PAGE. There is a possibility that the expressed AlcR protein could be seen by doing a Western-Blot analysis. However, the lack of a His-tag on the alcR gene did not allow us to explore this option. Figure 7. Schematic representation of the assembly of Plasmid 2. Figure 8. Schematic representation of the assembly of Plasmid 2 adapted from SnapGene. This plasmid is crucial in proving that our mechanism works (Figure 8). It consists of the alcA promoters (BBa_K2092002 and BBa_K2092003), which has the AlcR binding site, and chromoproteins to produce a visible colour change. 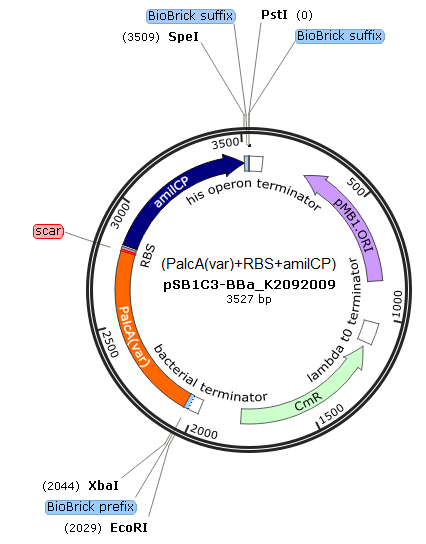 Similar to Plasmid 1 (CP3+alcR, BBa_K2092008), the alcA promoters and the chromoproteins were initially present in two different plasmids. They were first digested with the appropriate restriction enzymes, ligated and then transformed into E. coli DH5α. The final plasmid construct has chloramphenicol resistance. Just two weeks before Wiki Freeze and the deadline for vector submission, we attempted to prove that our model works. To do so, we co-transformed Plasmid 1 (CP3+alcR) and Plasmid 2 (PalcA(var)+amilCP). Despite the short time available, we managed to test our model on our FLUOstar Image plate reader, using the parameters provided in the iGEM registry (BBa_K592009) (λmax=588nm) and research paper (λmax=588nm, λmin=450nm) . We compared the dynamics of co-transformed (CT) colonies with one of our new BioBricks, CP3+amilCP, as a positive control (Ctrl) under the influence of different ethanol concentrations (0-5% (v/v) with 1% increment). The parameters used for ethanol induction were based on a similar study which tested the same alc regulon system in E. coli DH5α and One Shot TOP10 strains. Figure 9. 22-hour growth curves of E. coli DH5α containing: (i) co-transformed (CT) (ii) control (Ctrl) plasmids grown in LB broth (negative control). 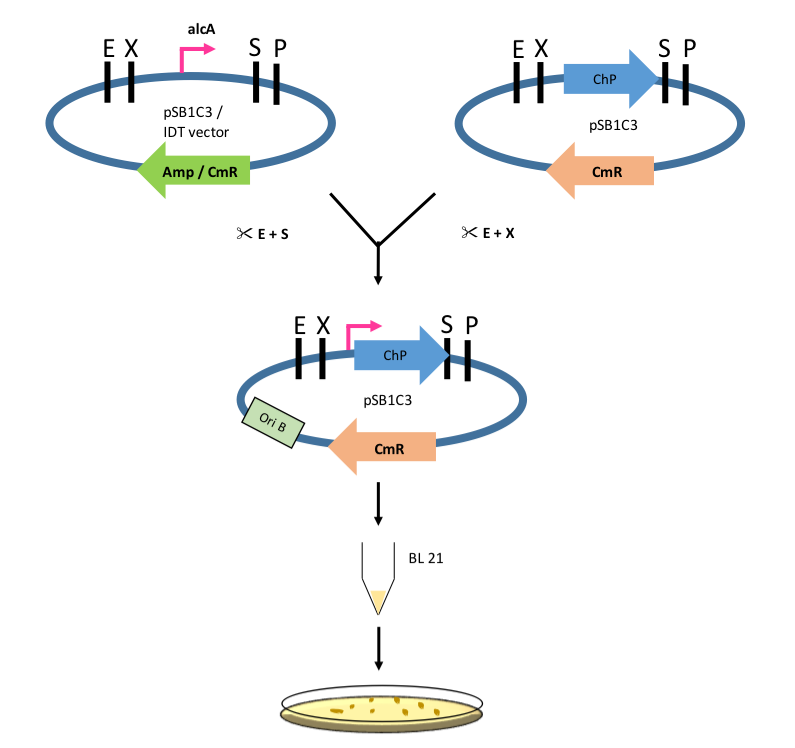 CT= Co-transformed Plasmid 1 (CP3+alcR) + plasmid 2 (PalcA(var)+amilCP); Ctrl= CP3+amilCP. Both CT and Ctrl sample groups were induced with different ethanol concentrations (0-5%) at mid-log phase, OD580 = ± 0.4. The samples were measured every 30 minutes at OD588 (λmax) and OD450 (λmin) using the BMG Labtech FLUOstar Omega plate reader, under constant temperature of 37°C. All points are the mean of 2 biological replicates for each plasmid, normalized to the blank with error bars = SD. 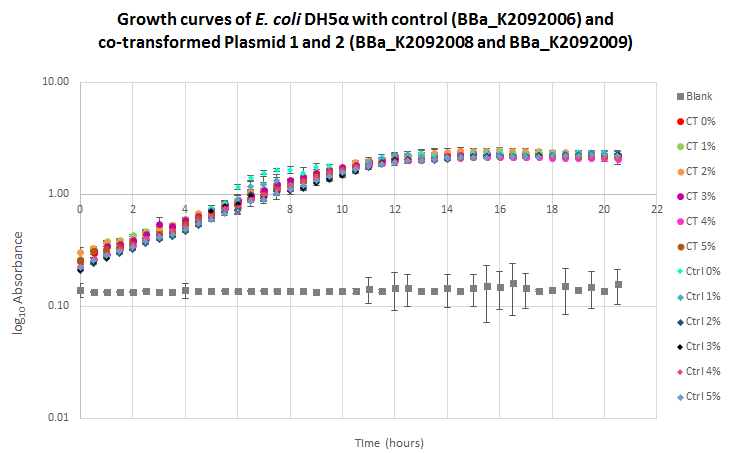 Figure 10 indicates that all of the E. coli CT and Ctrl plasmids had normal growth curve patterns over the 22-hours period with no detectable growth in the negative control. Our data analysis based on the 588/450 OD ratio showed that there was no difference between the dynamics of chromoprotein expression by CT and Ctrl plasmids - even when the blue colour on Ctrl wells were clearly visible by naked eye. We also did not observe a blue colour change in our CT samples despite being induced by different ethanol concentrations (0-5%). It is known that biological samples including individual cells in culture, tissues and subcellular structures contain particles which scatter visible light extensively . We hypothesised that light scatter could be the factor that caused interference. To test if this was the case, we attempted to purify our proteins before proceeding to perform the spectrophotometry test. iGEM CU-Boulder 2013 had a similar attempt which they used purified amilCP protein samples to run an absorption spectrum test (400nm-600nm), which they successfully demonstrated the maximum absorbance value of amilCP chromoprotein (λmax=588nm), identical to the λmax value previously reported. By using a similar approach, we managed to extract the AlcR protein from CT plasmid and amilCP blue chromoprotein from Ctrl plasmid using a BugBuster protein extraction kit. We then diluted the purified samples (1:10) using LB broth as diluent to see if we could identify the suitable parameters to validate our model. The purified samples were then used to perform an absorbance spectrum test (λ=350-650nm). Figure 10. Absorbance spectrum readings (λ=350-650nm) of 1:10 diluted (i) co-transformed (CT) (ii) control (Ctrl) plasmids grown in LB broth (negative control). CT= Co-transformed Plasmid 1 (CP3+alcR) + plasmid 2 (PalcA(var)+amilCP); Ctrl= CP3+amilCP samples, using the top optic of the BMG Labtech FLUOstar Omega plate reader under constant temperature of 37°C. There was no detectable peak at 588nm (λmax) (Fig. 10) . The parameters used to quantify the chromoproteins could be further optimized. Our techniques could be improved as this was the first time we performed this procedure. Other protein purification strategies should also be considered.